The Kentucky Derby is upon us, and for those who cannot trek to the state of Kentucky for the "greatest two minutes in sports", then the next best thing is to throw a Derby party! You may be asking, "When is the Kentucky Derby?" This year's Kentucky Derby is Saturday, May 5, 2018. Bust our your big hats and start mixing some mint juleps because it's going to be a wild time full of Southern flare. But first, let's start with the Kentucky Derby invitations. One of our more popular brands that we carry, feature some of the best Derby invites around. Odd Balls Invitations showcases unique watercolors designs and simplistic themes, perfect for your equine extravaganza. Browse some of their most creative creations and get the party planning started. Enjoy a theme party with roses and other ideas for the derby race. We have horse racing cards to help make your party a success while you work on figuring out the odds. Whether you're hosting a party or a bridal shower, our invites cards are traditional and unique. The Kentucky Derby is a great way to kick off your summer. It usually happens around May, which is when the temperatures start to rise. 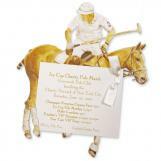 We happen to carry some fantastic summer party invitations outside of the Kentucky Derby as well. Our collections vary so beautifully, that they don't have to be horse racing invitations in order to have a great time. It's time to saddle up those friends and family members and throw a Derby party to remember. Feel free to peruse our best Kentucky Derby party invitations we have, or even take a gander at our themed western invitations which can surely fit the bill as well. We'll see you on the track! Our Kentucky Derby party invitations observe the race for the roses at Churchill Downs. Traditionally held the first Saturday of May each year, thousands of people flock to Louisville, Kentucky. Others that can't make the trip turn to the TV. Watching this thoroughbred horse race is truly a thrill. Those two minutes do not begin to cover the extent of the celebration, however. No doubt, the horses are the stars of the show, there is much more to the Kentucky Derby than a race. Enjoy this celebration with our gorgeous Kentucky Derby Party Invitations. Any event that also bodes a festival, is worth a look. The two-week-long Kentucky Derby Festival is bound with zest, fashion, and fun. As the host, you can create this vibe right at home. From festive themes and fun games to yummy, Derby-inspired recipes, gallop through to plan your Kentucky Derby party. Planning early for any party is always a good idea. Make sure your friends don't make any other plans for the Kentucky Derby. You can do this by sending your invitations 4 weeks or more in advance of your event. Enjoy the lovely designs of horses racing, thundering down the race track. Images of the jockey racing towards the final turn. The iconic hat that ladies in Kentucky Derby wear. Maybe you want to feature the famous mint julep, the official drink of the Derby. We have an invitation for all of these ideas. Need to know how to make this famous drink? Try this recipe for a Traditional Mint Julep: Use 1 lemon, rinsed + 2 teaspoons sugar + 5 fresh mint sprigs + About 1 1/2 cups crushed ice + 1/4 cup bourbon + About 2 tablespoons club soda. How to Make It - Step 1: With a vegetable peeler or a sharp knife, pare a 2-inch strip of peel (yellow part only) from the lemon, then cut into long, thin shreds. Cut the lemon in half and rub 1 cut side on the rim of a glass (10 to 12 oz.) to wet; save lemon for other uses. Pour 2 teaspoons sugar on a small plate and dip moist glass rim in it to coat evenly, then pour the sugar into the glass. Step 2: Add the 4 mint sprigs to the glass. With a wood spoon, crush mint sprigs with sugar to bruise the leaves and release the herb's flavor. (YUM!) Fill the glass with ice. Add bourbon, then fill up to the rim with club soda. Let stand until glass is frosty, about 2 minutes. Garnish with lemon peel and remaining mint sprig. Sip julep through a straw and add your winning smile! The mint julep is the iconic drink of the Kentucky Derby. Serve it in a silver julep cup for a traditional presentation. Looking for ideas on how to decorate? Take inspiration from the Kentucky Derby's nickname, the Run for the Roses. Decorate with this classic flower. Rose and boxwood topiaries make grand centerpieces. You can either buy topiary forms and simply place them in a proper container. Or, you can do it yourself with foam balls and wooden dowels. Once you have bought or made the form, simply stick pieces of boxwood into the foam. You can make a tight arrangement by cutting the boxwood pieces the same length and placing them close together. You can also vary the length of the boxwood pieces for a looser and more natural arrangement. Either way, they will be stunning. Last, add red roses into the foam for a pop of color and a Derby accent. Make your event one to remember. Have the guests dress up. Then, vote on the best or most creative jersey, and award the winner with a plastic trophy. Place wagers on the long-shot horses with your guests. The Kentucky Derby is all fun, playing games of horseshoes before the race and enjoying one another is all that it's about. No go, be off to the races and plan that party! With derby day right around the corner, it's time to start preparing. Order up, derby drinks Kentucky derby style. This famous horse race comes once a year but leaves a trail of memorable dust in its path. With the proper party ideas horse racing method, you are sure to win the cup! The hat Kentucky derby party theme is one stunner of an idea. Intrigue your guests by sending a hat stand invitation. It will encourage all the ladies, young and old, to don their finest apparel. One of the best things about the derby is the fashion. Let's be honest. We care about the horse. We have secret crushes on those trainers. We want to be best friends with the jockeys. But the true hero of the show is the race itself and how it draws out the finest in all of us. To adorn those derby party ideas horse designs are the route to take. Set the stage with one of these exquisite watercolor designs. It will have your guests giddy with excitement. Full of southern charm and a nod to all things preppy and sassy. The Kentucky Derby has been held annually at Churchill Downs since 1875. Traditionally, the race is held every year on the first Saturday in May. Fun fact, the Derby is the longest regularly run sporting event in the United States. It has often been called "the most exciting two minutes in sports." What better reason to throw a party? Help your guests feel really good before the party even starts by sending glorious invitations. If you choose to customize your invitations, be sure to add the date, location, and time of your party. It is also helpful to put the host's name, RSVP by date, and either your phone number or email. Pro-tip - start the festivities 2-3 hours before the actual race so that people can mingle. Get their grub on and show off their outfits. This is, after all, a Kentucky Derby party. Ask the ladies to wear their fanciest hats. Request that the men wear their most dapper of duds. Place a bet on who the winner will be! Announce it at the end. There are lots of great ways to decorate for a Kentucky Derby theme party. Decor for a Derby party can be any combo of colors that you like. You could start by finding a few fun props. From their, choose the color of your balloons, bouquets, and tableware to coordinate. Hats and even more Hats! Attendees of the Kentucky Derby are famous for their sense of fashion, most notably big, fancy ladies' hats. You might suggest your party guests come dressed for the day, and use some fancy hats as whimsical table centerpieces. Featuring the rose is an elegant choice. Additionally, the derby is called "The Run for the Roses." Did you know why? After the race finished in 1883 a New York City socialite handed out roses to all of the ladies present. Because of this, the red rose became the official flower of the Kentucky Derby. Today, the Derby is also known as "The Run for the Roses." A bountiful blanket of these flowers is draped over the winning horse. Incorporating roses into your Kentucky Derby party decoration is a great way to honor this tradition. You could use small bouquets of roses on your tables, arranging red roses in elegant silver vases, or even handing out roses to your guests during the party. It's an elegant and delightful way to celebrate this time-honored tradition!